Not to be argumentative but the Drama tour was also in the round. To: Joe From Port Jervis: If you saw YES In The Round, it wasn't 1977. Must have been 1978, 1979 or 1991. It is funny that there is that newspaper ad that says Yes sold out four months in advance,because I looked at those tickets everyday for those four months!Being just 16 my job was folding newspapers at the local store on Sunday mornings from 4:30 to six.For those shows (and the Zep and ELP shows that same summer! )you had to buy through a mail order system and the ad was first posted in New York Times.Thank God I worked there folding the huge NYT otherwise would never have known,too busy reading Circus magazine!! When I saw that ad in in February,sent my order in and got them,in the green section of the Garden.It was the third time seeing Yes but first with Wakeman.The Yours is No Disgrace still stands out as Howe and Wakeman put on a duel!! Looking back wondered why did'nt go to the next two nights,but being 16, with no car no money,it is easy to figure out now!! Im from Ireland and was on vacation at the time and couldn't believe I was seeing Yes for the first time in such an iconic stadium! Also stunned that Donovan was support with a rocking set using 2 drummers. Also have a memory of the smell of pot rafting through the stadium! Can't remember which night i went, althought i still have ticket stub. I went to all 3 shows. I had seen ELP in concert (I believe earlier that Summer) at MSG,but had gone with my older brother. I went to see Yes (all 3 shows) with just friends. It was amazing. And especially for a 14 year old budding bass player in a band that played what yes songs they could master. The opening (as with almost every yes show) was just mind blowing. And then Chris Squire shows up playing a Fender bass for Parallels. I didn't know what to do. I had bought a Rick 4001 because of him and here he is playing something else. But just for that song lol. I saw Yes many times from 77 to 81. Then didn't see them again in concert until the classic yes tour a few years back. Same great music, just older guys. Something we have in common. MY FIRST YES SHOW. LOOKING BACK 29 YEARS LATER I CAN STILL REMEMBER BEING BLOWN AWAY BY YOURS IS NO DISGRACE. ALSO AWAKEN WAS FANTASIC AND THE COLOURS OF THE RAINBOW WAS COOL.IM GLAD I WENT CAUSE 29 YEARS LATER AND ANXIOUSLY AWAITING A NEW TOUR TO ROCK TO. HOPEFULLY RICK WONT BOW OUT AS USUAL LIKE IN THE PAST.HATS OFF TO YES. 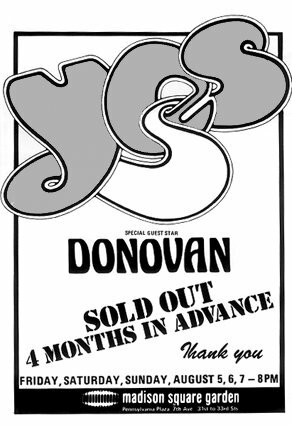 OK - I'm going to be honest - I know that I saw Yes at this MSG stand, but I really have no clue which night it was. It was my second Yesshow - the first being the previous year at Roosevelt Stadium. It was the first time I saw Yes with Wakeman on the keys. I had no tickets to the show, only about $30 in cash that I hoped would buy me a scalped ticket. On the subway ride from Queens I ran into a gaggle of aquaintences (friends of friends) and it just so happened they had an extra ticket! It cost me $20. $20.00 for eighth row center! Donovan was great - I really enjoyed his set. In between acts, I was hit square in the lip from a Frisbee probably thrown from the upper deck. I was swolen and bleeding when Yes came on (no big deal, though). Of all the many concerts I've been to before and since - this was the second LOUDEST I attended (the first being a Bowie concert at Giants stadium). The recorded "Firebird Suite" intro rattled the cement floor of the Garden. Alan White did a drum trill during that intro - and it felt like someone was pounding me in the chest! About mid-way through the set, I went out to the rotudda to get a beer, and after that (voluntarily) spent the rest of the show toward the back of the floor - near the sound board where everything was much clearer. Great show - despite the swollen lip. 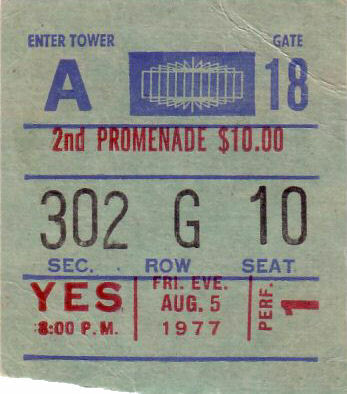 This was my first YES show, having missed the 1976 show at Roosevelt City because of exams. By 1977 I ate, slept, woke and smoked to YES music. 16 years old with some other YES teen-age friends / fans, we arrived at the Garden I couldn't wait for the show to start. I took a tab of something, and I clearly remember being led by a friend to the rear center of the Garden behind the soundboard during the Wakeman / harp piece of Awaken. There had to be some kind of 3 dimensional backdrop going on because the music suddenly filled my head and the stage looked absolutely amazing! I wish I could remember more, but that moment has stayed with me for 26 years. What a great web site. I'm going to have to pour myself a cup of black coffee to remember all my yes shows, but here's a shot at it. I attended with my three brothers. I was in 10th grade. First YES show ever. I was in the 300's at the Garden. I remember Parellels into Your Move/All Good people. Anderson had a huge Harp during Awaken. Starship Trooper, Roundabout and Disgrace were all encores. Donovan warmed up, I recall. Yes, the British rock quintet that gave the first of three sold-out performances Friday night at Madison Square Garden, deals in a kind of rock toward which this listener is normally indifferent or even antipathetic. That is the fantasy-laden, over-busy, semi-jazzish sort of artsy progressive rock that was especially popular in Britain in the early 1970's, when Yes first became massively successful. Today, with the punk rockers and rhythm-and-blues revivalists in full cry back to simplicity, this kind of art rock might seem a bit dated. But the primitives have hardly captured the mass audience in this country, at least not yet. In the meantime, it must certainly be said that Yes makes more interesting music than Emerson, Lake and Palmer, the Electric Light Orchestra or Queen, their principal competitors in arenas of this scale. Like all of these bands, Yes switches rapidly from idiom to idiom - from soft rock to (English) fold rock to jazz rock to space rock to hard rock. Unlike some of them; they do so in a way that manages to knit all the music together and they play with welcome cleverness and taste. on Friday, the flashy technocratic displays that have sometimes marred their music were largely absent, replaced by a telling exactitude of arrangement and color. In particular Rick Wakeman, the prodigal keyboard virtuoso who's returned to the fold, was handsomely restrained, and all the more effective for it. As a whole the band offered a fluid sort of pre-arranged music that was true to the structural clarity of rock (if hardly to the rhythm-and-blues and rockabilly basics of the [???] flowing energy of jazz. In basically instrumental music of this sort, the vocals are often extraneous. But with Jon Anderson's high, affecting voice and his laudable precision of pitch, and with harmonies from Steve Howe, the guitarist, and Chris Squire, the bass player, the vocals are never slighted. It can't be denied that the unavoidable crudeness of an arena sound system, no matter how sophisticated, blunts the intricacy and fragility of some of the passages that Yes achieves of disk. At the same time, the power of such a sound system and the immediacy of live performance invests the music with a welcome raw vitality sometimes missing on record. Alan, the drummer, and Mr. Squire make up a solid rhythm section, and at its most rambunctious Yes can rock in a way that can make one forget - or at least momentarily overlook its more self-conscious pretensions. In the past, when Roger Dean was doing the artwork, Yes was known as one of the most visually lavish bands around. Friday's show was relatively restrained in that regard, which seemed to disappoint some of the Yes fans in the audience but allowed a more undivided concentration of the music. Fortunately most of the music was worthy of the attention. Ultimately, Yes is still not the sort of band to which this listener will return often for recreational pleasure. It fails between too many stools and most of the kinds of music it purveys are better purveyed by ensembles specifically devoted to a particular style. Still, we live in a time of musical fusion, and much of the synthesis that Yes achieves is genuinely suggestive of other types of fusion that are proceeding more organically and subtly throughout the world. There is an element of [???] kind of art-rock that gets in the way of the delicacies the players aspire to. But that shouldn't blind us to the excellences of the effects they do achieve.